Originally released at the birth of the Intel TX Chipset, the AOpen AX5T has come a long way since its introduction over 5 months ago. Now, 3 revisions later, AOpen is back with major improvements on a near perfect design. The new AX5T is faster, more reliable, and is packing a punch greater than most competitors are willing to handle. When the AX5T was introduced earlier this year, AOpen's main goal was to release a product, based on Intel's TX chipset that would be competitive enough to last as long as they needed it to...before having to release another TX motherboard. This time around, with the AX5T Revision 3.1, AOpen's goal was perfection and they would except nothing else but the best...naturally, with a company as established, skilled, and successful as AOpen, they accomplished their goals, and then some! 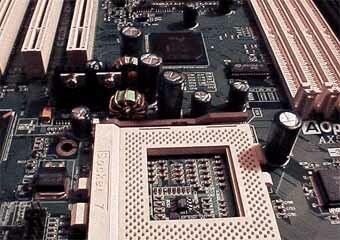 Beginning with the successful ATX design of the original AX5T (or the AT design of the AP5T if you prefer) AOpen took this motherboard to the absolute maximum. Packing it with 4 PCI and 4 ISA slots (1 shared) as well as 2 DIMM and 4 SIMM slots AOpen puts a great emphasis on expandability with the AX5T. And now with revision 3.1, the AX5T supports clock multipliers up to a whopping 5.5x, a feature found in many ABIT and Shuttle motherboards as well as lower core voltage settings for future Socket-7 processors. AOpen still refuses to go with a Jumperless CPU Configuration Utility like ABIT's SoftMenu with their Socket-7 motherboards, which is a bit of a downside. If the AX5T used dip switches it would have earned the full five stars under the Ease of Use category. The manual of the AX5T-3.1 is a very detailed and thorough manual, very descriptive and even contains quite a few useful FAQs. There is still some information to be desired with the BIOS Settings section of the AX5T's manual, however it is well above average, like most AOpen products. 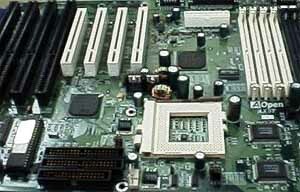 And as with most newer AOpen motherboards, the AX5T-3.1 comes pre-packaged with a copy of Norton Anti-Virus 95 as well as some other useful utilities such as Adobe Acrobat Reader. The familiar AWARD BIOS Setup of the AX5T is home to almost any tweaker, and although a few settings are missing from the Chipset Features Setup of the AWARD BIOS Utility it is still quite configurable by today's standards. Like some of the newer Shuttle motherboards, the AOpen AX5T-3.1 doesn't lack Hardware Monitoring Features. However, with the AX5T monitoring components such as the CPU Fan as well as aspects of your system like Voltages and Heat, are controlled via a front-end product called the Advanced Desktop Manager (ADM) which makes more sense since you don't spend all of your time using your computer in the BIOS Configuration Utility. The AX5T also features such unique gifts as the 3V Over Current Protection Circuit, which is a circuit designed to prevent the possibility of the CPU or Motherboard becoming "scrambled eggs" as a result of an increased amount of voltage being fed to either of the two. The AX5T boasts CPU Thermal Protection, a feature which slows down the CPU Speed and warns the user when the CPU temperature reaches a point higher than 55 degrees Celsius. One of the major advantages of the AX5T-3.1 over other motherboards as well as revisions of the AX5T prior to 3.0 is that it no longer uses the standard yet inefficient Linear Voltage Regulators rather Switching Voltage Regulators which explain the AX5T's incredible stability at ALL bus speeds. One of the major strongpoints of the AX5T-3.1, is its stability in addition to its performance. The stability factor is accounted for by two physical characteristics of the motherboard's design: 1) The use of superior Switching Voltage Regulators and 2) efficient usage of high quality Sanyo capacitors on the motherboard, especially around the Socket-7 IC and Voltage Regulators. Performance-wise, the AOpen AX5T-3.1 is among the best and gives the current leaders of the pack a run for their money. With a Pentium MMX - 233 overclocked to 290.5MHz the AOpen AX5T-3.1 receives the highest Business Winstone97 Score ever seen on Anand's Hardware Tech Page, an amazing 59.6!!! The AMD K6 and Cyrix 6x86MX both make themselves at home with this amazing motherboard, and when overclocking any of the chips tested here increasing the core voltage beyond ~0.1v of the recommended setting is not necessary at all for reliable operation. This once again goes back to the superb design of the AX5T-3.1. What are the shortcomings of the AX5T-3.1...keep on reading to find out...the AX5T tries to be the perfect TX motherboard, although it falls a few steps short of the gold. Other than the AX5T's picky nature about SDRAM and the modules you use (be sure to check out www.aopen.com.tw before purchasing SDRAM for the AX5T) the only other downside to owning the AX5T-3.1 is that it doesn't adhere completely to the ATX specification since the positioning of the Socket-7 IC is not directly in the path of the ATX Power Supply's Fan. Another problem with the AOpen AX5T-3.1 is that is simply will NOT work with Enlight power supplies, this is a huge downside if you happen to own one of those beautiful Enlight cases. Here are my Recommended BIOS Settings for those of you who have been having problems with the AX5T and higher bus speeds (not sure why you would need to, the AX5T didn't give me any problems at higher bus speeds with aggressive memory timings). Below are my recommended settings for bus speeds < 66MHz, and 75/83.3MHz. If you are using Non-EDO RAM, then use the settings the in the 2nd (Non - EDO) column, if you are using SDRAM/EDO RAM with a 50/60/66MHz bus speed use the 3rd (66MHz Setting) column. The next column should be used if you are using the 75/83MHz bus speed. ! Finally, if you are looking for the safest and most stable setting, use the last column.